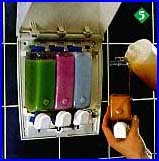 1 Ensure that the wall surface mounting area is clean and dry - free from soap film and residue. 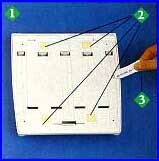 2 Place the adhesive tape tabs (included) into position on the Dispenser. These are not permanent. They are to hold the unit only until the silicone adhesive cures. 3 Run a bead of silicone adhesive (included) down the mounting tracks. 4 Press the empty unit firmly into position on the wall. The silicone adhesive requires a curing time of 24 hours before you can fill the chambers. 5 Fill the chambers and snap them into position. Presto! It's ready! 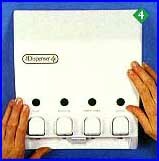 Complete installation instructions are included with every Dispenser! And if you decide to move, the unit is removable with no wall damage.